Professional Learning is the ​means by which teachers, administrators, and other staff acquire, enhance, and refine the knowledge, skills, practices, and dispositions necessary to create and support high levels of learning for all students. The Division of School and District Effectiveness is excited to announce our final Instructional Leadership Workshop for the 2018-19 school year. 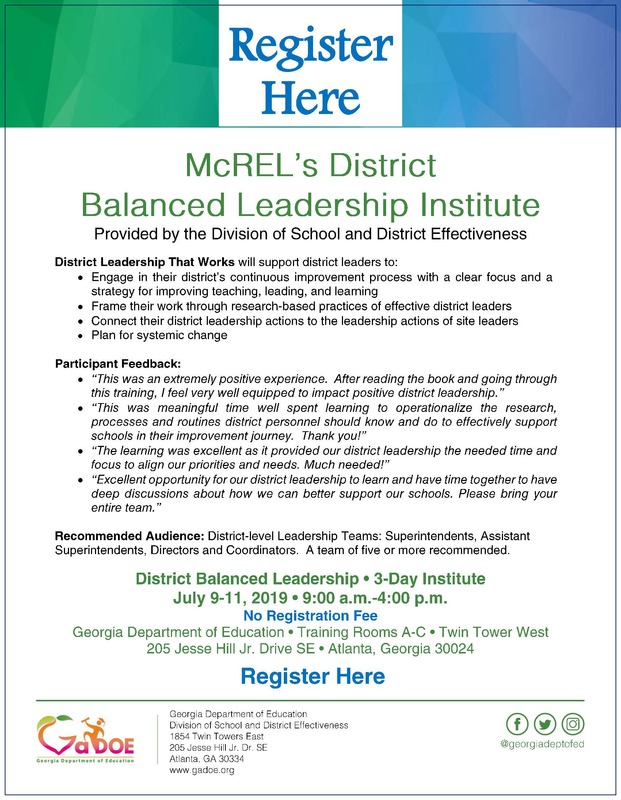 This workshop is intended to meet expressed and identified needs of school and district leaders throughout the state of Georgia and will be presented from a leadership perspective. Meal and beverages will not be provided. Time: ​​8:00 a.m. - 4:30 p.m. Lodging is available at Macon Marriott City Center for $94.00 per night. Audience: ESSA designated CSI, TSI, Promise and SIG school and district leaders only. Participants will attend all three days. Time: ​​9:00 a.m. - 4:00 p.m. There is no registration fee for this institute.